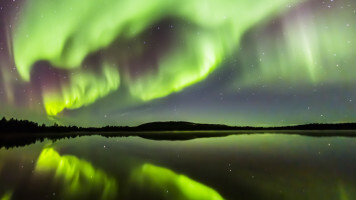 Now This Is How To See The Northern Lights. Once you get past the novelty of staying in an igloo, you might cringe at the thought of spending the night living like the Abominable Snowman. That is until you stay in at the Kakslauttanen Arctic Resort in Finland. If “glamping” is considered the high-end version of roughing it in the woods, then Kakslauttanen is the comfortable way to vacation in the Arctic. The accommodations at the Kakslauttanen Arctic Resort offer a spectrum of experiences from a cosy night in a log cabin to a night in Santa’s House. 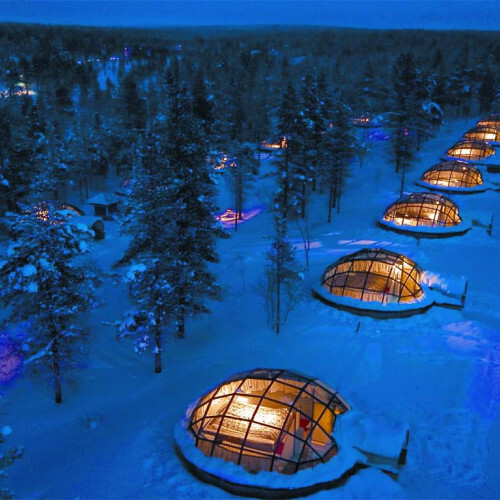 The glass igloos at Kakslauttanen are nestled underneath the northern lights (how’s THAT for a night light?) while the Kelo-Glass igloos--a sort of log cabin, igloo hybrid--offers saunas, fireplaces and a glass roof for a slightly (warmer) option. Glass Igloo Or Snow? The Choice Is Yours. For the true daredevils (and cold-resistant travellers) out there, the option of staying in a traditional snow igloo is available. While the temperature inside the snow igloo is definitely brrrrr-inducing, the resort offers down sleeping bags to ensure you don’t wake up looking like Elsa from Frozen. The accommodations at the Kakslauttanen Arctic Resort run the gamut from igloos to cheekily named “Gold Digger Cabins” on the Golden River. Whatever your preference, one thing is certain: at this resort, you won’t find the fanny-pack toting, all-inclusive crowd. 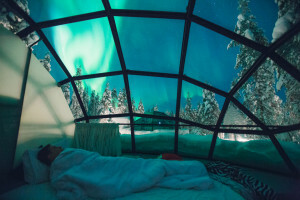 The most incredible way to see the Northern Lights as they shimmer right above your bed. Igloos with saunas. Yep, you read that right. Or, go for a more traditional snow version. The kind of unforgettable experience everyone will envy you for.